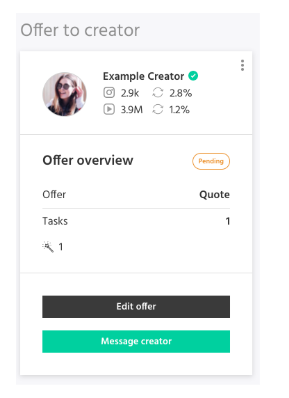 If you’d like to update an offer you’ve already sent to a content creator, whether already accepted or still pending, you can do so by navigating to “offers” and selecting the right content creator. By clicking on the “Edit offer” button you can change or add any particular information that was negotiated between you and the influencer. Once in the editing mode, you can change the details of your offer in the same way as when you first created it. To apply your changes and resend to offer to the content creator click on the “Resend offer” button. Change the terms of an already agreed offer. Note: if the content creator has already accepted an offer from you to participate in the campaign, resending the offer will create a secondary offer for them to accept or decline. If the new offer is accepted, it will overwrite the old offer. If the new offer is declined, the previously accepted offer will still stand. For more information on how to fill in an individual offer, please see here.